If you or a family member have been in the hospital lately, you probably know that nurses are on the front lines of healthcare. Nurses are often the first practitioner to see a patient and have the most ongoing contact. No one disagrees they play a vital role in the system. 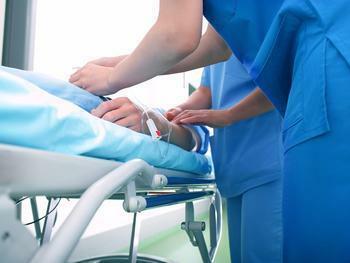 But a new survey from employment site CareerBuilder.com finds a growing shortage of nurses that threatens to create inefficiencies within the healthcare system. Careerbuilder says well over half of healthcare employers have current openings for nurses but can't find qualified candidates. While all industries complain about that problem, CareerBuilder says the complaints from healthcare employers are 7% higher than any other industry in the survey. In the first quarter of this year, the average number of individual job postings for registered nurses was 178,586. But the total number of nursing job postings during that time was 10 times that amount, meaning every nursing job was posted an average of 10 times. This isn't just a problem for hospitals and doctors offices. Both nurses and patients are being affected. CareerBuilder says its survey of nurses reveals a growing amount of stress. With so many unfilled positions, existing staff must work longer hours. Fifty percent of nurses in the survey reported "feeling tired all the time," while 35% reported sleepless nights, 33% gained weight, and 32% suffered high anxiety, all symptoms of higher than normal stress. At the same time, another 32% of nurses reported aches and pains and 19% said they suffered from depression. Nearly all the nurses in the survey said their employers offer no assistance to deal with stress. None of this is good for patients. Staff shortages can make it harder to get timely appointments. More important, tired, overworked, and stressed-out healthcare workers are probably not at the top of their game, and may be prone to errors. The survey results no doubt don't come as a surprise to professional nursing associations, who have been warning of a nursing shortage for years. The American Association of Colleges of Nursing reports nursing positions are expected to grow from 2.71 million in 2012 to 3.24 million in 2022, an increase of 526,800 or 19%. During that time, it says the profession will also need 525,000 other nurses, to replace those who retire or quit.